Facebook is suitable for the Enterprising Investor, but not the Defensive Investor, who is concerned with the short earnings history, lack of dividend payments and the high PEmg and PB ratios. The Enterprising Investor’s only issue with the company is the lack of dividend payments. As a result, the Enterprising Investor should feel very comfortable proceeding to the next part of the analysis, which is a determination of the company’s intrinsic value. From a valuation side of things, it is important to consider the company’s demonstrated growth in comparison to the market’s implied estimate for future growth. In this case, the company has grown its EPSmg (normalized earnings) from $0.11 in 2010 to an estimated $0.77 for 2014. While this demonstrated growth is strong, it does not support the market’s implied estimate of 44.04%. Such a high growth rate is most likely unsustainable, and conservative investors will be very hesitant to proceed with using any rate that high. As a result, the ModernGraham valuation model returns an estimate of intrinsic value below the market price at this time, and the company appears to be overvalued by the market. 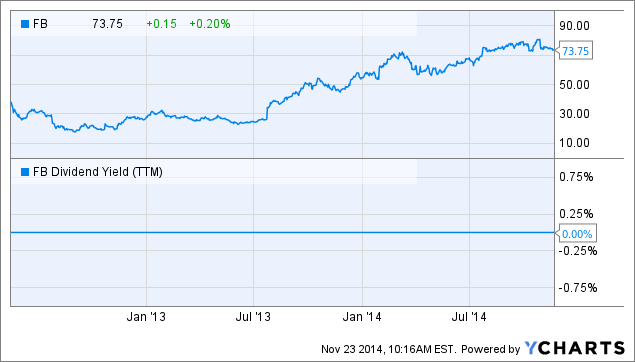 Be sure to check out previous ModernGraham valuations of Facebook Inc. for better perspective. Read the full valuation on Seeking Alpha! Disclaimer: The author did not hold a position in Facebook Inc. (FB) or in any other company mentioned in this article at the time of publication and had no intention of changing that position within the next 72 hours. Logo taken from Wikipedia for the sole purpose of identifying the company; this article is not affiliated with the company in any manner.